MMG WEEKLY – WHAT ARE THEY SAYING THIS WEEK? Housing news, consumer attitudes and personal spending are plentiful. Housing data kicks off on Tuesday with the S&P/Case-Shiller Home Price Index and Existing Home Sales, followed by New Home Sales on Wednesday. Consumer Confidence will be released on Tuesday, while the Consumer Sentiment Index is coming on Friday. Durable Goods Orders join weekly Initial Jobless Claims on Thursday. Friday brings the second read on fourth quarter 2015 Gross Domestic Product, along with Personal Income, Personal Spending and the Fed’s favorite inflation gauge, Personal Consumption Expenditures. 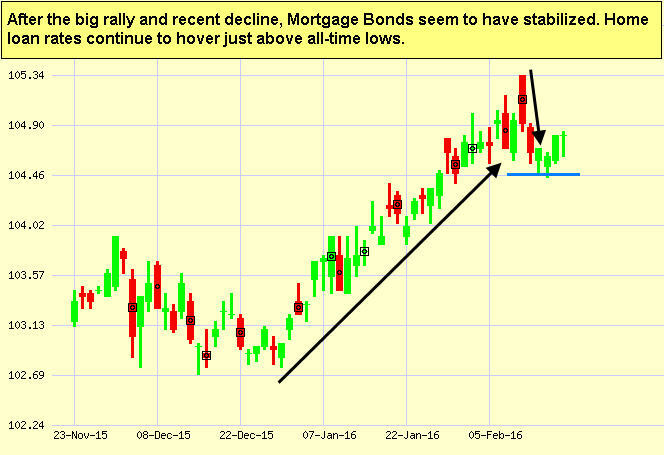 As you can see in the chart below, Mortgage Bonds rallied recently, keeping home loan rates in historic territory. If you drive a car, truck or van for work, you’ll want to know the standard mileage rates the IRS has set for 2016. These rates are used to calculate deductible costs for driving an automobile for business, medical and moving purposes, as well as driving for charitable purposes. A few of the rates have decreased since last year. According to the IRS, rates are based on an annual study of the fixed and variable costs of operating an automobile. Recent dramatic drops in fuel prices have lead to the decreases. Before you calculate your deduction, make sure you qualify. Taxpayers cannot use the business standard mileage rate for a vehicle after using any depreciation method under the Modified Accelerated Cost Recovery System (MACRS) or after claiming a Section 179 deduction for that vehicle. Other requirements for calculating the amount of deductible business, moving, medical or charitable expense can be found in this IRS publication. The IRS provides the standard mileage rate for ease and convenience only. If you prefer, you may calculate the actual costs of using your vehicle instead of using the standard mileage rates. Check to see which saves you the most! Please feel free to pass these helpful tips along to your team, clients and colleagues. Mortgage Market Guide, LLC is the copyright owner or licensee of the content and/or information in this email, unless otherwise indicated. Mortgage Market Guide, LLC does not grant to you a license to any content, features or materials in this email. You may not distribute, download, or save a copy of any of the content or screens except as otherwise provided in our Terms and Conditions of Membership, for any purpose. The material contained in this newsletter is provided by a third party to real estate, financial services and other professionals only for their use and the use of their clients. The material provided is for informational and educational purposes only and should not be construed as investment and/or mortgage advice. Although the material is deemed to be accurate and reliable, we do not make any representations as to its accuracy or completeness and as a result, there is no guarantee it is without errors.